From when you're broke to when you've finally made it. Spend your last summer vacay before entering the ~*real world*~ in Palawan, where you’ll gain a better appreciation of the Philippines. 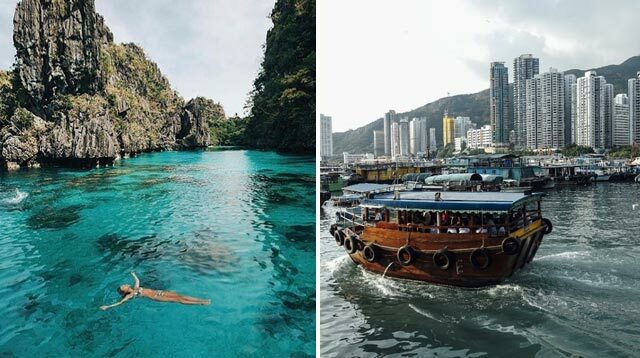 See the Underground River; live it up in El Nido; relax in Honda Bay; venture out to Coron; and check out the restaurant scene in Puerto Princesa. For your first time out of the Philippines, pick a nearby, visa-free destination with a good balance of culture and modernity. You can’t go wrong with either Hong Kong or Singapore. With amusement parks, excellent shopping options, clean neighborhoods, cultural attractions, and a public transportation system we really wish we could replicate in Manila, they give us a glimpse of what the Philippines could’ve been. There’s a good reason why Japan is on everyone’s bucket list: The scenery is amazing, the culture is incredible, the people are so kawaii, and the food…we can go on forevs. A trip here can drain your wallet, though, so start saving up for it ASAP! One of the easiest ways to know if your man’s a keeper is if you can go on trips together without wanting to strangle each other. Davao’s a great place to make new memories if neither of you has been there before. See the Philippine Eagles up close; try the stinky but tasty durian; and frolic on the pristine shores of Samal Island. The idea of traveling alone can be daunting, but it’s not as lonely as it seems! Cebu is an excellent choice for your first solo trip. It’s well connected, so you can totally hop on to Negros or Bohol for more adventures! Exploring a new country on your own is an empowering, exciting experience every girl shouldn’t miss out on. For your first solo trip abroad, Thailand is a great option. See the temples, and go shopping in Bangkok. Make your way down south to Phuket for some fun under the sun. You can also check out Pai and Chiang Mai for a more laid-back adventure. And since it’s one of the leading backpacker hotspots in the world, you’re bound to meet several other solo travelers (maybe even a hottie!) while you’re there! Every girl (even the most tamad ladies out there) should try climbing a mountain at least once in her life. Yes, it’s tiring, and your legs will be killing you for days after your climb, but that sense of pride you’ll get upon reaching the summit is irreplaceable. If you can only climb one mountain, make it Mt. Pulag. With several trails for all experience levels plus an amazing summit view, it’s a must-visit destination for non-hikers and experienced trekkers alike. Spending your honeymoon in Paris might not be the most original thing, but come on, it’s the City of Love! If you’ve had your fill of France, you can head to other equally romantic countries like Italy and Greece, or you can explore Hungary, Poland, Croatia, and the other countries in Eastern Europe to veer slightly off the tourist track. Got more cash to burn? Head to the Nordic countries to see the Northern Lights for a trip you’ll never forget. Securing a U.S. visa isn’t the easiest thing to do, so to maximize your chances of getting approved, make sure you have a stable job before applying. You’ll really need to save up and prepare for it, but the trip will be absolutely worth it.